The following is Plan Design Xplore’s commentary on the Design Overlay Zone Amendments, currently working their way through the City process. We are glad the City has decided to take a new look at design review, since the status quo for design is not great. Unfortunately, a lot of what’s in the current draft really misses the mark. We’ve drafted a few simple, baseline design ideas that can form a foundation for harmonious design based on observation. First, the City should conduct a visual preference survey in order to ascertain what design types the people of Portland really value. Without this basic information, it is difficult to define good design when crafting clear and objective standards. A harmonious built environment is more than the sum of its parts. We can allow architectural innovation while ensuring that the majority of ‘background buildings’ are making quiet contributions to the overall fabric by reinforcing established norms. When cutting edge design is integral to the development concept, it is appropriate for a project to go through the discretionary Type III Process, which uses the subjective guidelines approach. However, the majority of workaday development projects are not conceived as design-forward investments, and for them, pushing the design envelope is not critical to their success. 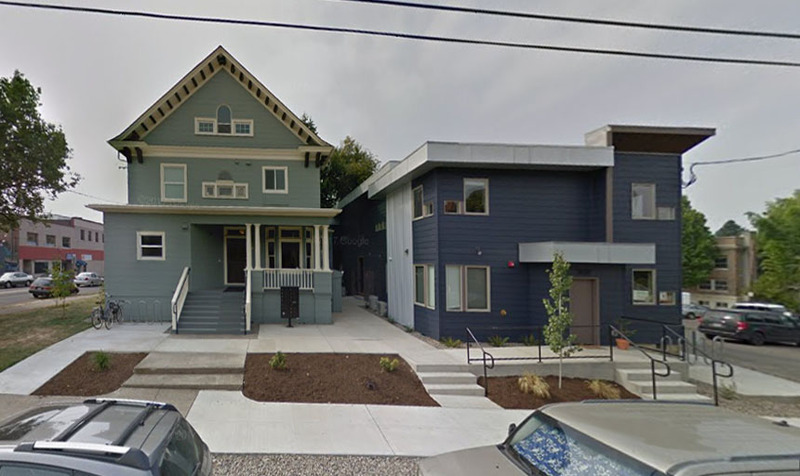 In these cases, building design should be steered toward a baseline form that is consistent with Portland’s foundation architecture. This basic form of building has been applied consistently for centuries, and consistently appeals to most citizens. Regular window placement – Windows should be stacked vertically and of consistent size and shape. Symmetry – facades should by horizontally symmetrical, preferably mirrored around a central vertical stack of windows. Window aspect ratio – Windows are historically taller than they are wide. This is because of simple physics; spanning shorter distances with a lintel is easier. It also relates to the proportions of the human form, making the building relate to the scale and aspect ratio of our bodies. Vertical composition – buildings should have a very clear base, middle and top. Cornices define top. Base consists of storefront with clerestory windows and higher floor-to-ceiling height. Minimize articulation – building wall articulation should be at a ratio of the scale of the entire facade. Indentations can provide a break in scale but should be applied to create axes of symmetry. Do not articulate every room or unit. Do not create arbitrary push/pull shapes. Cladding material – surfaces should be smooth and consistent. 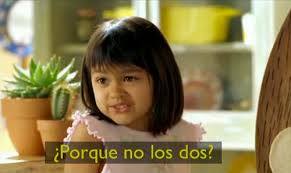 Brick or stucco are preferred to metal. 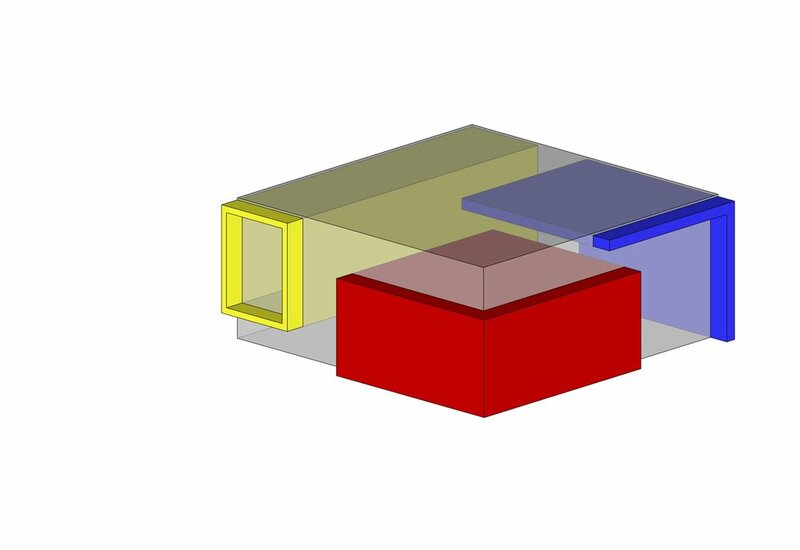 Do not compose facades based on increments of 4x8 sheet products. Consistent parapets – set a datum for the parapet and do not deviate from it. A cornice, even a simple one, should be applied at the top of the highest floor’s ceiling. 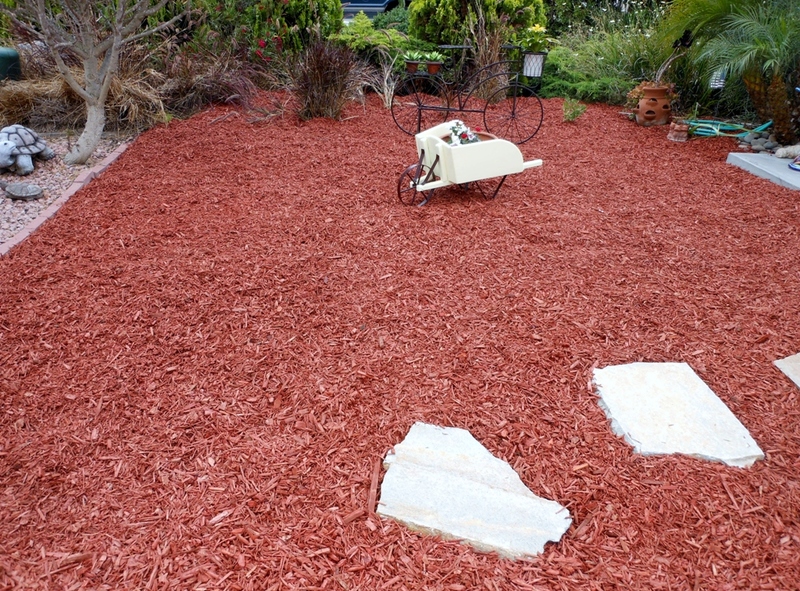 Minimize number of materials on walls – differentiating base top and middle is the only reason to vary materials. Do not outline windows or add other shapes. Spandrel panels should be the same material as other wall areas. You can contact the City directly with feedback of your own. Correct use of articulation at building scale to break walls and define symmetry. We’ve had some things to say about façade gimmicks and their cumulative degrading effects on our main streets and centers. There are many reasons why this trend is happening, not least of which is the dominance of building component manufacturers in the way we design and construct today’s buildings. 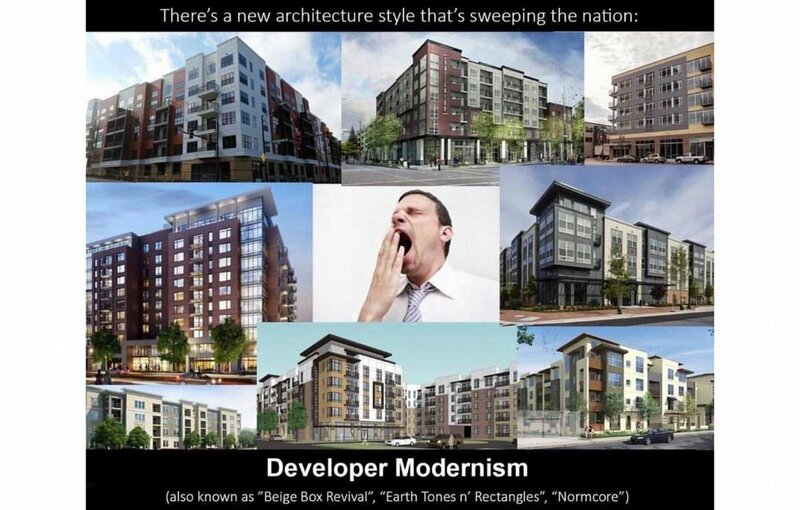 Sometimes, however, it’s simply fun to point out some of the more absurd “trending memes” in façade design. We took a sharpie to this building and cleaned it up a bit in our last post, but we didn’t really talk about why it looks so silly. Well folks, have you ever done one of those word-search puzzles? We were looking at this building’s odd composition and noticed the precedent. The designers have used projecting flanges to “circle” arbitrary groups of windows. Perhaps the occupants could place some letters in them and spell things. Architectural gimmicks get old really fast. The first time a visual flourish is used, it’s creative. The second time it’s derivative, and after that it’s just kind of pathetic looking. All the more so because these gimmicks are fundamentally superficial. Mr. Potatohead graphic design gimmicks are emphatically not Modern with a big M, because they don’t tell us anything about the internal divisions of space or about the building’s structure. They’re little more than wallpaper. Order and heirarchy of forms make this conform a lot more to the Vitruvian rule of reflecting the proportions and ratios of the human body. Stripping away the arbitrary flanges and ribbon shapes reveals a form that more clearly conveys a familiar and recognizable pattern language. ﻿Recently, Plan Design Xplore had the opportunity to sit down for a conversation with Architect Brett Schulz. Schulz is perhaps best known for his long-standing collaboration with developer Kevin Cavenaugh (the two share an office space in one of Cavenaugh’s buildings), but Schulz’s work goes far beyond that partnership. His buildings have a unique vocabulary that stands out from more conventional designs. 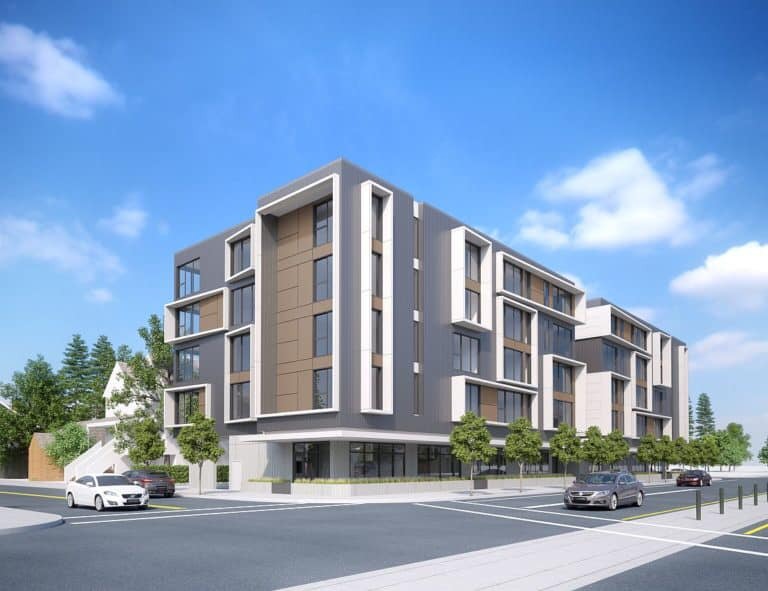 Schulz’s diverse portfolio includes mid-rise apartments, single family home renovations, restaurants, adaptive reuse projects and multi-tenant office buildings. Plan Design Xplore: A position we’ve arrived at from looking at different projects is that not all density is created equal. We’ve observed that there are different outcomes and impacts from creating buildings in smaller or larger footprints. 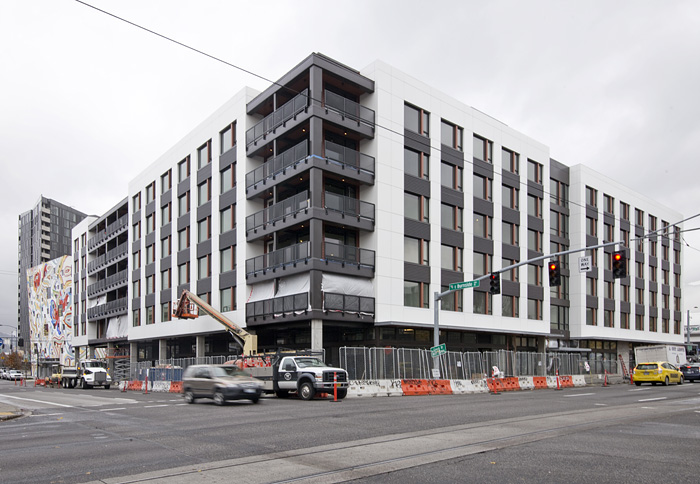 You mentioned a goal of “cramming a lot of units in a small space that doesn't blow out the the scale of the neighborhood.” I see that contrast in your project on Burnside and the one across the street from it. Can you speak to that? Schulz: Yes... One of the things is that we don’t pick the site. The developers come to us with sites. We find that smaller developers often have a better rapport with what we’re trying to do. We’re a small company and we seem to have a good relationships with smaller developers. This was a fairly small site… a double-length, 50 by 200, or 190ft after the city took dedication. But still we were able to get a lot of units on this site on a relatively narrow site with no corner frontage. 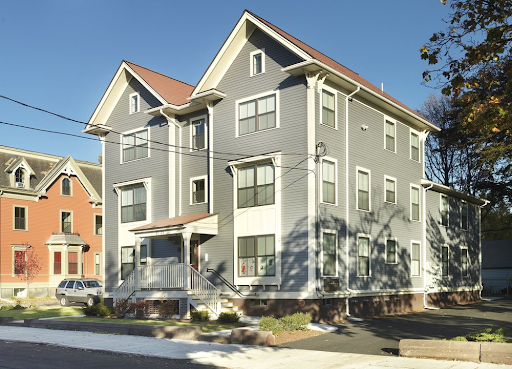 One of the ways we designed this to fit into the neighborhood better was by having a pitched roof with a dormer 5th floor instead of having a five-story building. This is simultaneously a reaction to the requirements based on the zoning code, and it was also a way to be more contextual with Buckman with the single-family residential buildings that are around there. At first it seems kind of ridiculous to say that a five-story building can at all be contextual with a single family house, but it actually does when you think about this: It’s the language of dormering. What this is doing is creating [...] breaking down the scale of the building instead of eroding it. Now when you look at those buildings that are now done across the street; those are six-story buildings straight out to the lot line, maximizing every single square foot you could possibly do. And they're also pretty much odes to the zoning code in terms of the design overlay. They’re doing exactly verbatim what the planners are allowing you to do in order to maximize your site. PDX: They’re following the path of least resistance? S: “Path of least resistance,” exactly. They use the materials and the language of the path of least resistance. We try to avoid doing that and working within constraints, for sure, but also create -- doing something way beyond but also leaving opportunity for some kind of creative expression too, and doing something that we can be proud of. We’re trying to make a city that we want to live in and trying to design a future that we want to live in. 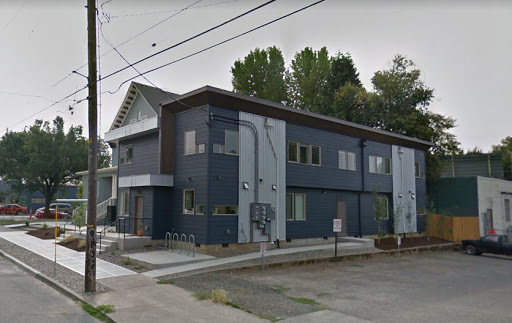 PDX: Now this building is something that we find particularly interesting because it is a mid-block space, and when it comes to new infill It seems like there are a lot more opportunities for mid-block development than there are for corner spaces in Portland. What do you think were the most challenging pieces of this mid-block development, or for these spaces just in general? S: Construction-wise it was a very challenging site. There was, and still is a vacant lot next door which the contractor was able to rent out, but there was almost no staging area. Much of the property line walls are within a foot or two of the property line. That makes for construction challenges. There was also nowhere to deal with stormwater, so we had to implement a dry well onto the building, which is doable. These are all things we can manage. Utilities also were very challenging with street trees and utilities coming all off of Ankeny St. There was only a very narrow window where we could-- we had to maintain the existing street trees for the urban forester and then we also had to bring in water, sprinkler, gas lines, sewer lines, all that. S: And a driveway. It was a very, very tight squeeze to get everything in, but we had a really good contractor. S: Architecturally the primary challenge is getting daylight into the interior units, and especially on a 200-foot long building there are a lot of interior units. So you can see that we built near the property line at the middle and the ends, and then left these half light wells where we set the building back 5 feet in order to provide daylight to those windows. Which also helped break down the scale of what would be a long bar of a building. S: There was another developer who we worked with soon after this who admired this building (SE Ankeny) and had had a couple of sites that he was asking us to look at. His goal was to maximize the volume that he could put on the site. This was at the time a “C”-zone, which would now probably be a “CM.” Where there are zero setbacks are allowed, but he had acquired sites that had like “RH” or “R1” zoning where there's this variable setback requirement you might be familiar with. S: And I’m really glad they were able to do that because Ankeny is a pretty wide street, and it’s the perfect kind of hidden away, sort-of speakeasy feel. As opposed to being right on Burnside which is much more traffic but almost no pedestrian traffic. PDX: Do you feel like there’s some sort of big untapped market or at least some market for more micro retail spaces like that? S: Absolutely Yeah this building has five and they rented them out pretty quickly. I think there's a better market for it than larger spaces, even. PDX: How would you define “micro retail” in terms of square footage? S: Like with a threshold? Around 500 sqft roughly. S: Yes. We’re seeing everyday increasingly that the internet is taking business away from small retailers. One response to that is to keep their overhead down by having a smaller space and having only enough stock as needed, you know, to use in a few days and have another storage facility off-site if it’s retail, or the same as a restaurant. PDX:Can you tell us more about your “Jake’s Run” project. I’m thinking that’s probably an older project? S: That is. That’s coming up on 20 years old. When the client came to me with that site, he really was sensitive to the context of the hills above 23rd Avenue in Northwest Portland. It was adjacent to some very high-end properties and he knew it would get pushback from the neighborhood. So we really went all in on trying to make it fit into the neighborhood in an English “arts and crafts” style. And I think -- the density belies the scale of it because there's five units on a 7000-foot site that was zoned R1. S: But by putting pitched roof on it and adding dormers, you know, we brought the scale of it down. 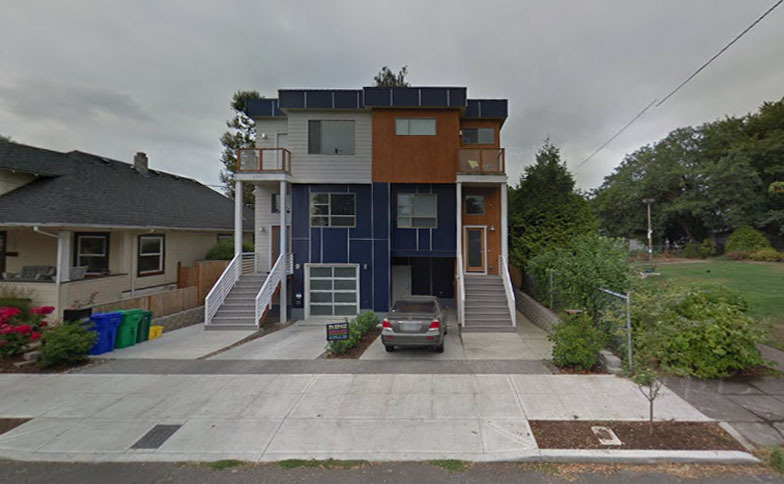 So what are actually 4-story high units look like a 2 1/2 story cottage from the street and it was a pretty successful project, but… we did things that other developers don't: like cedar windows throughout; stucco all the way around, not just on the facade. He went all-in with Viking stoves, quarter-sawn oak floors, handcrafted iron railings. So it was a very unique situation where we were trying to capture the character of the historic houses nearby and put it in a denser environment. And that did have one parking stall per unit. PDX: Generally how do you feel about the idea of using that sort of design approach to achieve compatibility in historic context? PDX: You know I’m a believer in context, but … Let’s say the threshold for tolerance among developers of going that extra mile seems low in Portland. And this is true nationwide, that the quality and the amount of money people are willing to put into a speculative project just continually goes down over time, and most developers will just do the minimum they can get away with. I have to admit this developer never did a similar project to that. He moved on to multi-family housing that was more conventional. And no one has ever come to me in 19 years and asked me to do a project just like it, and I think it's because the return on investment is lower. What you need, I think, are developers willing to take a little lower return on their investment in order to create a quality product. That’s not in the nature of speculative development. Whereas once upon a time if someone built an apartment building like that they were likely going to hold on to it and own it, and have a sense of pride. Historic apartment building, across the street from Schulz’s office in the Kerns Neighborhood. Likewise on commercial buildings. If you owned a hardware store you were going to build it and then move into it and it was a representation of your business. Now most often the people who are moving into a space didn't actually create it. Some speculative developer builds it, then someone else buys it and operates it. So there's a disconnect between that sense of ownership and that pride of ownership, I think. I don't know how we bring that back. Science fiction is replete with metaphor, so to continue our theme from the previous post, we’d like to explore some particularly unfortunate design trends using Gene Roddenberry’s idiom. Readers may recall Star Trek episodes where transporter technology was central to the storyline. If Scotty, or Miles O’Brien screwed up the transporter, horrible things might happen, like somebody getting beamed into a wall or something. Something similar seems to be happening to buildings in American cities. Where the quest for novelty and expression of a zeitgeist meets investor driven budget concerns and standardized off-the-shelf parts, we get the current architectural meme, “break up the box.” The idea comes from a dictum, frequently expressed in city design guidelines, that architects break up large masses into smaller scale modules. On the face of it, this sounds like a good idea. And it might be if it were done with any logic or rigor. The idea is that large buildings are inherently ugly and alienating. A categorical assumption like that should make you suspicious. We can all call to mind large buildings we’ve seen that are elegant, pleasing and allow us to get a sense of human scale by the way they are composed. Some large buildings are dreary and oppressive, and these codes can probably be seen as a reaction against failed utopian megastructures like the public housing projects of the mid 20th century. At the same time, in a post-postmodern world, we don’t really have a coherent style we can identify with our time. Other eras had dominant styles, and most people were pretty familiar with them. It was pretty easy for the lay person to tell which designs embodied the style well and which were interpreting it poorly, or in a superficial way. Today it’s very hard to judge competent application of a style, since we can’t even agree on what styles are appropriate. The culture of the architecture and design world has become divorced from the culture of building and trades, exacerbating the problem. Before this schism, builders with little formal education participated in a culture of building that yielded uniformly coherent, pleasing forms regardless of the budget of the project. Today’s typical speculative buildings, by contrast, offer no sense of craftsmanship, and often flat-out reject well established principles of symmetry, proportion, hierarchy or really any kind of visual logic at all. Instead, we’re presented with pointlessly arbitrary shapes and materials, arranged in a skin-deep composition that starts to look more and more forced, the more we’re forced to look at it. Here’s how it works. A goofy array of shapes, suggesting a bunch of different smaller volumes are overlapping in space. This is what we’re supposed to understand about those shapes; that we’re actually looking at several distinct volumes that have materialized in the same space, with little bits spilling out around the edges. Viewed from above, we clearly see this for what it is. A silly outfit on the surface of a box. Take off the garments, and the true nature of the form is apparent. Tagged: design, architecture, STNG, ugly, hardiboard, "arbitrary shapes", "break up the box"
The authors of this blog have been spending a lot of time roaming the suburbs for work lately. As we drive our vehicles around the postwar landscapes of Gresham, Happy Valley and Washington County, we’re stuck by how much the experience is like being outside the atmosphere itself. Plenty of room at the outer docking ring. Suburbia consists of a formless void with no oxygen or habitat suitable for humans between buildings and designated activity zones. There is no “Life between buildings” (Jan Gehl). The shopping center is a space station. Your house or apartment is another space station. So is the school, and your workplace. You can’t go outside without a space suit. You get in the shuttlecraft and pilot from destination to destination at warp speed, so you hope, but instead you’re stuck creeping along at one quarter impulse. The cops are Cardassians. The teenagers are Klingons (who cares if we die? We’re going to Stovokor!). There’s lots of space here, but it’s not for humans. It’s all interstitial. At best, one can walk safely across a parking lot, but it’s not a place to linger. Take a starship and fly to a planet. Beam down in Downtown Portland, Hawthorne or some place on the coast or the mountain for shore leave. Walk around. Go back to your station. Entertain yourself in the holodeck (a simulacrum within a simulacrum). One of last year’s most iconic images sums up the experience beautifully! Top down on a sunny day! 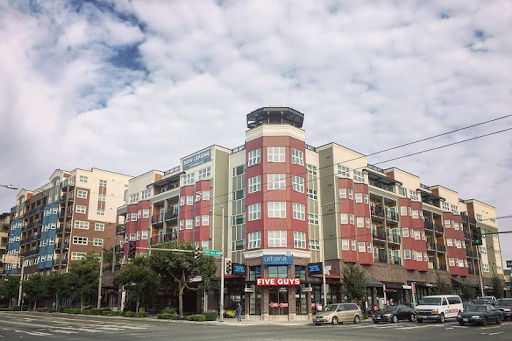 Tagged: Suburbia, "Life Between Buildings", "public space", transportation, cars, suburbs, "Washington County"
There’s a perennial debate in the design and planning world about what kinds of standards are appropriate for new development in a historic context. Should new buildings blend in, or stand in contrast? Is it “phony” or “context-sensitive”to replicate historic vernacular forms? This post is the result of a conversation with city staff regarding Portland’s Conservation Districts. Over the course of the conversation, while trying to articulate what I thought was most important about compatibility and integration of new buildings with existing fabric, I hit upon the phrase “Diagramatic Compatibility.” This idea really connected because it stands in contrast with other conventional notions of compatibility, and gets at a deeper level of design than the (literal) superficial matching of materials, colors, etc. that some codes prescribe. Diagramatic compatibility can be defined as matching the key schematic elements of composition for a block or district. It includes approximate massing, proportions, overall height and setback lines, relationship of the building to the street, to its site, and the rhythm of buildings along the street in relation to one another. This is distinct from the particular vernacular style of the building (Queen Anne, Tudor, Craftsman, Prairie Style, Streamline Moderne, etc. ).The latter refers to the particular visual language of a building, while the former refers more to what it’s saying in a given language. Often a new building is neither stylistically nor diagramatically compatible, in which case it’s easy to be confused about why it feels like a bad fit. My argument is that diagramatic compatibility is far more important than stylistic compatibility. It is my contention that a house or building that is stylistically dissimilar yet diagrammatically compatible is far more appropriate and responsive to its urban context than one that is nominally of the same style while exhibiting a very different configuration, massing, relationship to site, etc. This row of Queen Anne Victorians in Seattle’s Central District was joined by a new neighbor fairly recently. As you can see, the newcomer is composed in a completely different idiom, yet it continues the rhythm of the row of houses that came before it. What matters here is the overall proportion of the building, its pattern and placement of windows and doors, it’s overall form factor, and its relationship to the site and to the street. What “historical” typology is this? By comparison, this new addition to the Boise neighborhood at NE Fremont & Rodney is at least nominally compatible, in as much as it is composed in a “historical” vernacular. However, something about it just doesn’t look right. That’s because its particular configuration, large house with the main floor elevated above the ground plane on top of a two car garage, with a wide driveway taking the place of a lawn and stoop, is something that doesn’t have any historical precedent. It’s an entirely new configuration, dating to within my lifetime. There are a few early 20th century houses that have basement garages, but they remain subordinated to traditional site arrangement principles. Finally, I’d argue that vernacular ways of building, which are sometimes referred to as “historical” are not anachronisms at all. They are still perfectly valid ways of building. Existing examples constructed in pre-war vernacular are highly functional and beloved by their residents. I personally resided in one of Portland’s oldest houses, the James Duthie house. The house has been partitioned into a triplex with upper, ground floor and basement units. I lived in the upper unit. I found it both convenient and enjoyable (not to mention spiritually uplifting to experience continuity with generations of residents reaching back to the Lincoln administration). This recent courtyard townhouse project Carlton Landing in Oklahoma was brought to our attention by our esteemed friend and incremental development advocate/coach R John Anderson. It demonstrates that contemporary buildings with a vernacular design vocabulary aren’t necessarily “fake history” - they’re just good, carefully detailed, thoughtfully designed buildings. There’s absolutely nothing obsolete about the overall composition or architectural expression here. Most importantly, the diagrammatic form of the building is entirely consistent with the Prewar, non-autocentric forms we advocate here at Plan Design Xplore. Like our content and our mission? Come join the team and write for us! It is our goal to broadcast more voices to the world of urban design and planning in Portland and the greater Pacific Northwest. 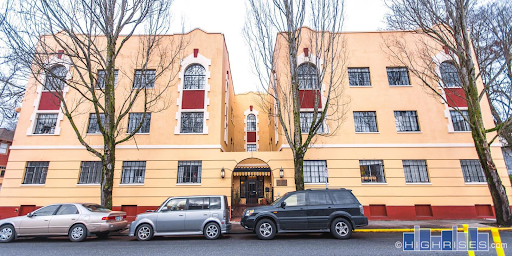 Share your thoughts on our Building Portland blog or join us for neighborhood tours and help us generate our Case Studies for our Lexicon, we would love to have you on board. We also have a number of new programs coming up that we can plug you into, from our Imagination Challenges which will be launched by the end of the year, to our future neighborhood podcast coming in the Spring. If you want to hone your interviewing skills, let’s get in touch with some of your favorite architects and developers around Portland and provide our community with the story behind the places they build and design. 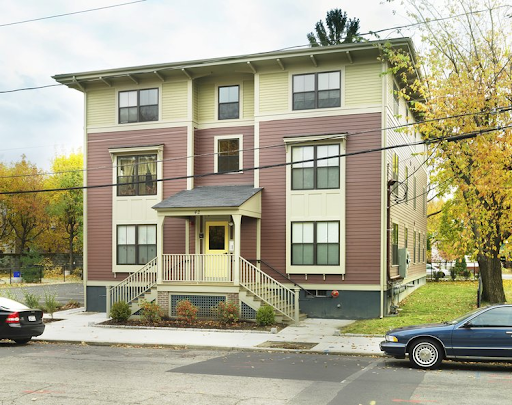 The opportunities you have with P-D-X as a writer and contributor are great, we will provide you with the platform, the social media presence, and the editing power to get your thoughts and designs out into Portland’s housing conversation. This post is a response to a presentation on Autonomous Vehicles to the Issue Forum on the Environment at the City Club of Portland. If autonomous vehicles are the future, and there's no stopping it, it’s going to be a profoundly depressing one if you’re somebody who loves traditional urbanism. Cities in other countries have already solved the problem of urban mobility, and they have largely done so with 19th century technology. A combination of cycling and rail infrastructure serves Copenhagen very well, and it has the lowest share of all trips made by car of any city in the world except maybe Amsterdam. This is all provided with publicly owned infrastructure: bike lanes and walkable streets, and a three tiered state-owned rail system. Metro subways, suburban commuter rail, and intracity rail. As with many high tech solutions, I think the AV phenomenon is a case of technological fetishism combined with corporate capitalism's existential need to sell us more things. The so-called Smart City infrastructure needed to get an AV system up and running would be very expensive, and presumably funded in large part by municipalities, for the ultimate goal of selling more cars. A relatively low-tech, very effective method of solving urban mobility issues is a non-starter here because capitalists are the clients of government, which prioritizes their need for profit when addressing any social issue (see the farm bill, private prisons, our health care system, etc.). This is not to say that mercantile capitalism shouldn't exist in any form to deny that it produces innovations. Indeed, lots of great shiny widgets have been developed in recent decades because consumers like them and see value. That's all well and good, but things like smart phones are a technology one can opt in to or out of. When it comes to things that quite literally shape our cities, we must recognize that it is not in societies best interest to let capitalism and corporations drive the bus, as it were. In short, just because we can, doesn't mean we should. Our mobility problems are not a result of insufficient technology, but rather poor resource allocation. Doubling down on a technology (cars) that has already proven extremely destructive from a land use, sustainability, resource efficiency and public health perspective does not strike me as great policy. And don’t just take my word for it. Walkable City author Jeff Speck has a similar take on it. Let’s see if we can’t rationalize this a bit. Using a simple, time-honored scheme of proportions, traditional widow forms and strong cornice line, this blobby mess of arbitrary forms now looks clean and elegant. It doesn’t compete with the glam-rococo forms of the theater! Note that it’s not ornamentation we're going after here. The lavish blingy forms of the theater are true to their historical precedents and have a rigor that makes them rational, whether you love them or hate them. They follow rules of order, symmetry, hierarchy and proportion. Now the apartment building also follows some well-established rules rather than screaming for attention with arbitrary, tacked-on shapes that have nothing to do with the structure of what’s going on inside it. So much better! 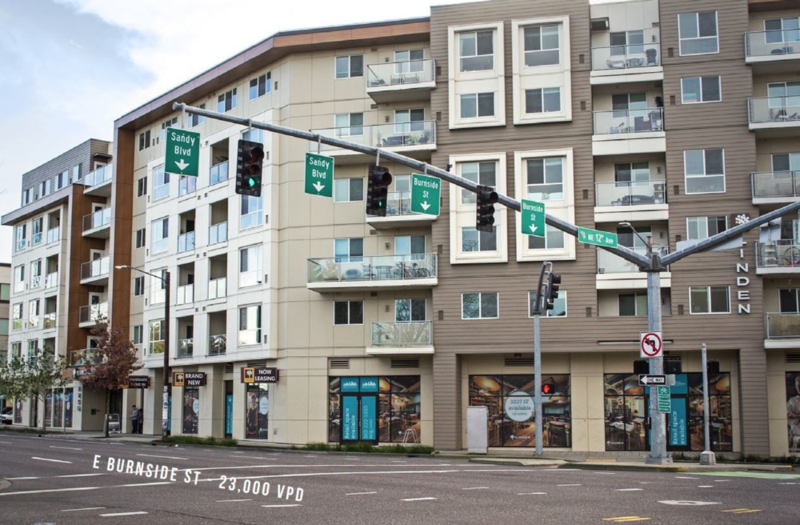 Would Portland be more supportive of new development if the quality of that development were better? 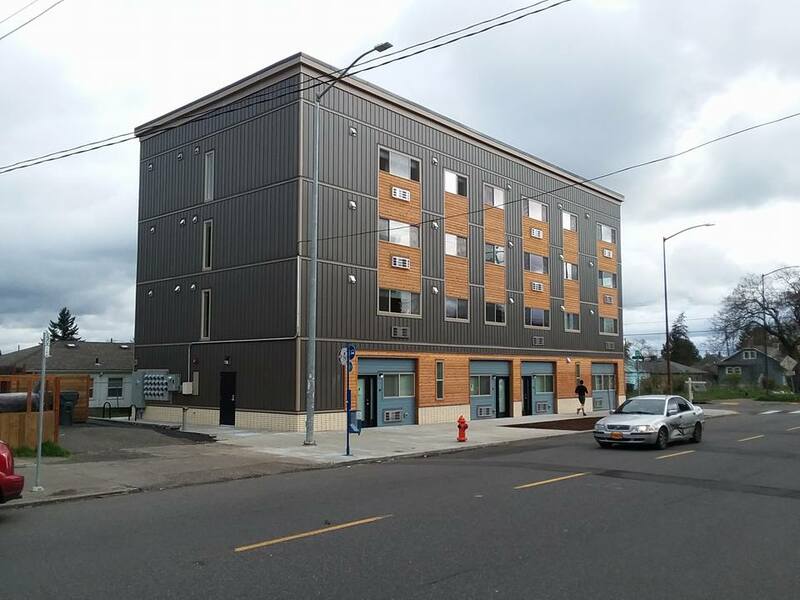 We recently profiled Lloyd Russel’s project Creston Lofts, located in the Creston-Kennilworth neighborhood in Southeast Portland. We were intrigued by this unique design, so we reached out to Lloyd for a conversation about Creston Lofts, Zoning, and creating community-oriented urbanism. 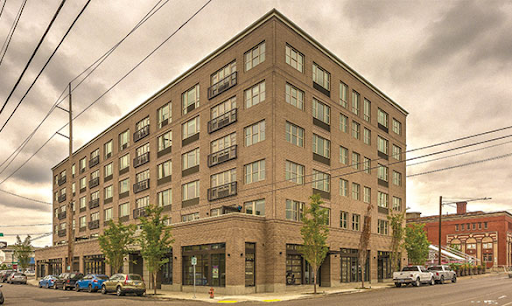 Plan Design Xplore: We came across Creston Lofts on one of our walks around Portland neighborhoods, and we think that it’s a really excellent project for a number of reasons and we wanted to ask you about how the project came about. Can you talk about the history? I could never figure out why Los Angeles existed if my teachers at Cal Poly were telling me that architecture was the highest art and calling for anyone in life, and I could never answer that. Lloyd Russell: So I'm an architect living in San Diego, from San Diego, I went to Cal Poly San Louis Obispo and spent my last year abroad in Copenhagen. When I was in college I was always questioning the role of the architect. How the architects could do more, because I was always driving back and forth from San Diego through LA to get to San Luis Obispo, and LA was like this bane on my distance, and I could never figure out why Los Angeles existed if my teachers at Cal Poly were telling me that architecture was the highest art and calling for anyone in life, and I could never answer that. I couldn't answer that question until I figured out that I had to ask the question of why buildings got built and that got me into the economics of building. And then I also got into building buildings, not just being an architect; I liked to go out and work with contractors to build stuff. So long story short, when I graduated I found an architect that would do design-build, and built his own stuff, and develop his own stuff. And so I started working with him as an owner. I acted as an owner, a builder, and an architect-developer-contractor on a handful of projects so I got to see that sort of stuff so I get to have the role of an owner the role of a contractor the local architect, and then live in the building, to get the role of a user. LR: [Teaching] has been consistent throughout my career, and we were always trying to teach housing. And we can never teach housing without a budget, because there's always constraints to housing, unless it’s a custom home and it’s pie in the sky, but it was always hard to convey to the students, like, some reality, and so we started to teach them a pro-forma, which is a little hard in an architecture-housing studio. Eventually evolved into starting a program that we called a masters in real estate development. That was like ten or twelve years ago and it was how to be an architect developer, and it became a master's program for students at Woodbury University. I think it was one of the first ones in the nation to offer the whole thing. At first when we were doing this we thought, oh my God, we're just gonna create competition for ourselves in San Diego, and this is gonna be terrible! But it ends up that through the sharing of information we're not really competing against each other. It's more of a synergy, so there's a whole bunch of people doing like-minded buildings that are not the standard a developer building because they always have a little twist ‘cause there's an architect in there somehow and the sharing of information helps. But down here our big battle is this building department, and zoning that is just ridiculous. When I was on the redevelopment board for the Center City, which was the Planning Department for downtown. That's when I started to work on Creston, and I read the zoning document from Portland, and I was like Oh my god, you guys in San Diego are so myopic. You have this Byzantine zoning document that contradicts itself and nobody knows what it means and as a result nobody can build any housing and up in Portland you have this very concise, form-based zoning which is so clear to everyone that it makes it really easy to plan and develop projects, and I was trying to get [San Diego] to incorporate some of the form based on it. PDX: Your answer anticipates one of our next questions, which is why develop in Portland, since you're based in San Diego. So that's probably what brought me up to Portland. I found it very similar to Copenhagen in the weather and in the urbanism; never really raining just, drizzly kind of thing. Everyone bought into the urbanism - here in San Diego, everyone's complaining about how, oh my god, there's no parking! 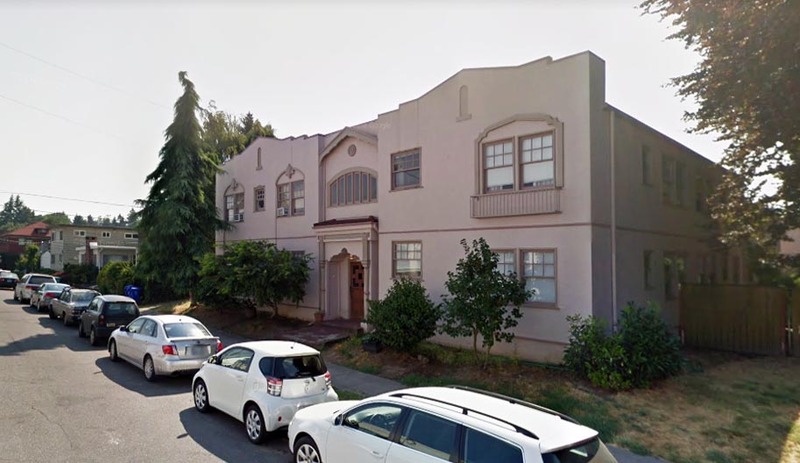 LR: First zoning, where there was no limitation on the floor area or the density to set the form based zoning and it was near to where Andy lives so there's kind of a close connection to Reed College. If we have a 10,000 square foot parcel this will be a really interesting project and In that time Andy was showing me new projects around Portland because he was very concerned that we were going to do something very modernist and at that time. I think this was 2008, 2009, 2010 kind of time period. There was a big discussion about modernist versus historical stuff happening in Portland. The design of Creston was actually kind of a critique of some of the projects that I saw at the time, where a lot of projects would just max out what they could do just because they could, and what I didn't like was when you have the form base zoning and then it transitions into a neighborhood, and there was no transition! It was oftentimes a big blank wall, or you know the scale wouldn't fit. And since this was going be the first project in that intersection, I was trying to figure out a way to kind of mitigate it into the neighborhood. A campus of three buildings seemed like a more appropriate way to kind of soften the transition into the neighborhood. It also allowed me to develop deeper into the block because a full-coverage building with double-loaded corridors would not allow for cross ventilation and a lot of light, stuff like that. So I was trying to figure out a bunch of what I call single-loaded buildings where there's not a hallway. PDX: That's one of the things that struck me the most about housing in Copenhagen; I don't think you're allowed to do double-loaded corridor buildings, so all the perimeter blocks, while they look fairly massive, aren’t very deep; they’re made up of through-units with at least two window walls. LR: Yes, there's a lot of projects we didn't have the scale for but this also goes back to the developer portion where you know when you're when you're the developer you don't want to build anything wasteful, I guess so what I was trying to avoid was you don't want to build infrastructure that you can't rent, so no elevators no, hallways or corridors, no lobbies, and when you take that out of the equation and everything you build is rentable, you might be building less density, but it's a more efficient building. So that was kind of the attitude; I build with lobbies, elevators, corridors, that might take up 20% of the building, and even though I have a bigger building, I have to borrow more money and It's not as efficient so it's not as feasible. 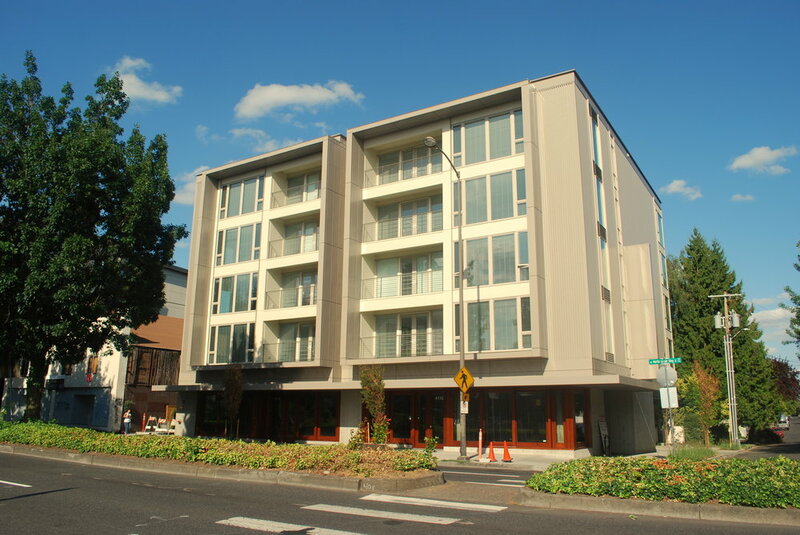 PDX: We’ve seen a handful of projects in Portland like Holst’s Meranti Lofts, with no elevator were you have townhome units on the upper floors so you enter on the third floor and you take an internal stair to the fourth floor your bedrooms. Is that similar to Creston? LR: Yes. Ideally you want everyone to not have an elevator and walk around the property because again, as a developer, I'm not paying for the maintenance of the cost elevator. But and the other hand, from an urbanist standpoint, if people are walking around the property, those are the eyes and ears on the street that make it more secure and that's how you get to know your neighbors, and the property becomes more safe and more vibrant and you build more of a community. I've done buildings where there are elevators and the tenants don't know each other from one end to the other or one floor to the other and there’s a totally different vibe of the building. I guess this gets to building types. It’s like, if you're gonna get to the elevators and corridors it to achieve your economies of scale, then you have to really pay attention to how you break down the scale and make it more of a community. For Creston we had a 30-foot height limit, so we're telling pressing up against if it's either two or three stories. You're kind of against that limitation. I wanted to make sure that we could develop into the into the interior of the lot as well, and there's a transition to the east where there was a building to cut it to the south where it was going back into a two-story and one-story houses, stuff like that. PDX: I noticed you have a really large Japanese maple mid block. I'm assuming that’s a holdover from what was on the site before. LR: Exactly - The house had a big tree in the back and we decided to preserve it. We could we develop the property around it or we could always plant a tree, but that was such a nice tree. That's the kind of thing you can do when you're the designer and the owner - you can make decisions like that and then work around it. Usually the architect gets the mantra from the developer that I need X number units no matter what and then you're kind of screwed, so part of the architect developer thing is the person that decides the program is the one with the power. PDX: We've walked around this property and taken a lot of photos, but obviously it's a very complex division of space. How do all the units Tetris together in there? LR: I like very site-specific building projects. Each orientation of a building, of the units, is unique unto itself and also from owning these buildings… There's kind of a housing experiment going on, so this is definitely for rent. I'm not doing condos because when you get condos It's got to be the lowest common denominator. That's very comparable to something else ‘cause someone doesn't want to buy something that's unique. But when you're making rental properties, you can make a very unique floor plan and sometimes that's what makes it rent - because it's a one-of-a-kind unit in a city and someone's gonna say. Oh my god I'm the only person that has this window this giant window that pivots, or I'm the only person that has this really cool layout or something like that. So I try to imbue the units with this kind of drama. Or taking advantage of whatever orientation is and so each of the buildings is addressing that condition. The building on the east is economical town houses, but they’re walk-up. See you walk up to three three-story building and there's a little juice bar on the ground floor and then two studios on the ground floor, but the second and third floor you walk up, and I put the bedrooms on the second floor, so I called it upside down master - the bedrooms are on the second floor, and then you go all the way upstairs and the living room is on the top floor because that's where the view is. So that has a certain efficiency. PDX: So there's an attitude toward affordability in what you want to build. 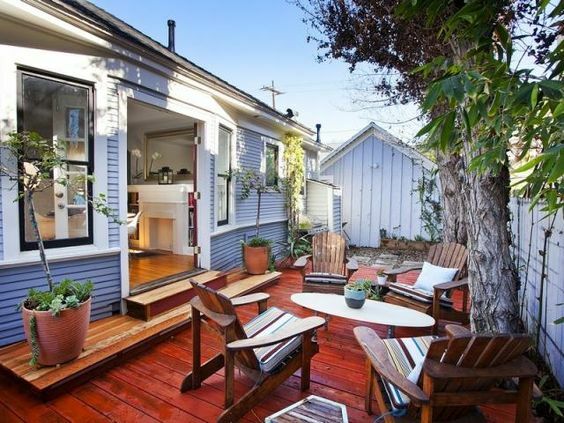 LR: My attitude towards affordability is sort of like this: you want to build it as small as you can, but you want it to appear as large as possible, and in order to appear as large as possible you want to connect it to outdoor spaces. There's myriad health benefits that come along with that as well. Renters want bigger spaces, they want closets, they want this that or the other and it's like well yeah, but then your rents gonna be so high… so you're trying to… I want to give them a lot, but I want it not to cost too much, so I try to get them dramatic spaces, so that usually comes into things like tall ceilings, big windows, a connection to the outdoors, stuff like that. In the corner building, we have a restaurant on the ground floor, and that was a friend from San Diego that married a friend of ours in Portland and moved. That worked out. It has a semi-public space on the second floor, so it's this giant deck, which has four studios off of that. It's extra wide - it's over 15 feet. I can't give you private outdoor space but I'm going to give you semi-private space, where you share it with maybe two neighbors or something like that. Also, it was taking the ground plane and saying here's the here's your patio, but it's on the second floor, and then from the second floor you can go and walk up to the third floor unit which has a big deck. And the other building on 28th, that was that was this other fun thing that we were trying to do part of the experiment. There was an existing house, and I wanted to save the house and raise it, raise the structure and built concrete walls underneath it. We went down the road of doing that but the house was in such bad condition we had to tear it down. But the idea was always to have something that was kind of like a house up above and have live-work below. 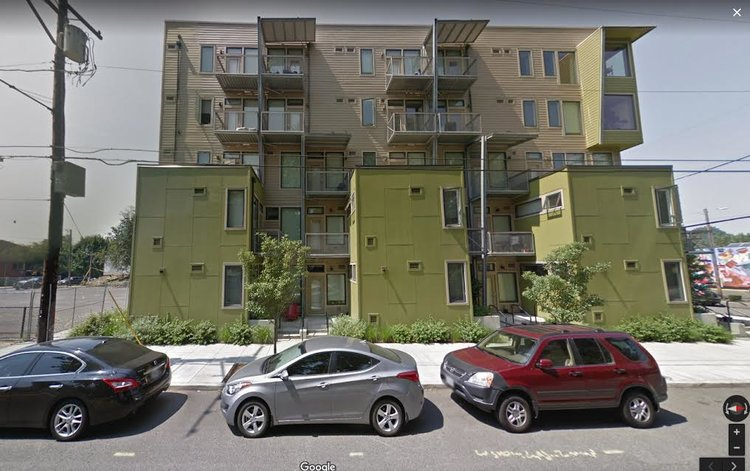 PDX: So I'd like to understand how those spaces work… I understand that those are live work and the owners of those spaces have residential space behind them facing the courtyard with the tree, is that right? LR: Yes, then there are two more on top - penthouse units. Yeah, sot here’s two units up above, and two units down below. I think the manager has a barbershop down there. So before we get too far down the road, my friend that’s the other owner of the main partners are myself and who Andy Lair is the founder of Deform which is a general contractor company in Portland. Andy was a key component of it, I mean finding the property, giving me the latitude to do what I want, and then building it. That's what managing it and making sure that or inspiring me to take care of all the edges so it would fit well and was a good project. Part two of our conversation with Lloyd continues here. This week we’d like to introduce the concept of the urban Transect as a way to understand the taxonomy of our built environment. The term emerged from the New Urbanist movement a couple of decades ago as a way to talk about the different concentric layers in the structure of a city. The term is borrowed from biology, where the transect was used to describe the various distinct zones form shore to inland forest. Let’s take a look at what a transect is and how it works. A journey from the center of Portland, through its suburbs, through its rural hinterlands to the wilderness reveals the astute nature of the New Urbanist’s observations. We travel from the corporate towers of the Central Business District (CBD) through the rapidly developing mid rise areas like the inner east side, to the street car commercial districts and early 20th century neighborhoods, with their modest houses packed together on small urban lots. Eventually the pre-war streetcar city gives way to the inner ring post-war suburbs with their auto based patterns. These are places like East Portland, on the far side of I205, Cedar Hills, Raleigh Hills, Milwaukie and Maywood Park. Eventually we reach the later suburbs, where a more relentless auto based morphology asserts itself, replete with corporate chains in near identical strip centers and large scale housing tracts developed by corporate developers. Finally, we clear the Urban Growth Boundary and enter the orchards, tree farms and vineyards in places like Corbett, Sauvie Island, Banks and Boring. Since we’re fortunate to enough to live in Oregon, our transect reaches to relatively pristine wilderness in our National Forests. We think the transect is a great way to look at Portland’s urban fabric. We’d like to posit that the various housing typologies we’re documenting with our case studies have ideal habitats, and that those habitats can be described by transect zones and sub-zones. In the ideal-typical model of a city, as conceived by the New Urbanist transect, is basically a series of concentric rings. Viewed in three dimensions, it’s a tiered wedding cake of density and intensity, with the CBD at the center. In reality a transect map of most cities, Portland included, would be more irregular. It would appear as more of an octopus, with tentacles spreading outward from the core. This distribution reflects the way the city grew in its first century, starting at the core and spreading out along streetcar lines. In its spatial form, Portland is a classic “street car city.” Most of our fabric (note this only applies to Portland proper, and not the suburbs and exurbs that later merged to form today’s metropolis) was platted and developed before WWII. Our distribution of houses and business corridors reflect a pattern where workers commuted via streetcar to the core. In the evening, they’d return home on the streetcar, and get off at the cross street where they lived, stopping to make purchases as they disembarked. For this reason, our arterials, most of which are former streetcar lines, are lined with what is referred to as “street car commercial buildings. The original Fred Meyer, at SE 36th and Hawthorne. Now home to Bread & Ink Cafe. The commuter would then walk back to his house with an arm full of provisions from Fred Meyer or whatever local merchants lined his commute, to his house. This resulted in a pattern of streetcar lines at intervals, and houses in between. Density ramps down as one moves away from the arterial, then back up again approaching the next arterial. If we’re going to apply this logic to Portland in a meaningful way, we will need to parse the transect zones a little more finely. We propose adding a second tier to the hierarchy for urban zones. This yields a sequence of T3, T3.5, T4, T4.5, etc. T3.5 = Inner neighborhood residential areas between boulevards. We’ll dive deeper into this Portland-specific transect hierarchy in a future post, as it’s a topic deserving of some serious research, especially if we want to use it as the basis of policy recommendations. As an aside, we will probably want to consider suburban transects in tandem as we plan and manage our growth. Portland and its suburbs are managed by a regional plan, the Metro 2040 plan, which was conceived as a holistic regional growth management plan. To our knowledge, Portland is the only metro in the US with a regional plan that has any real teeth - other cities claim similar but they are merely aspirational documents, not policies. 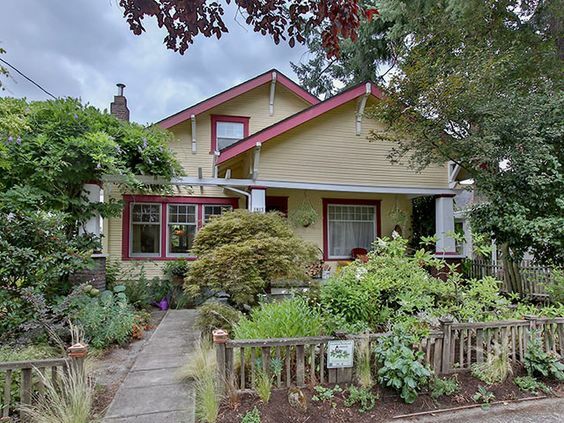 Meanwhile, even within Portland’s city limits, there’s quite a bit of post-war suburbia. Beginning in 1981 Portland annexed East Portland, which had hitherto been the no-man’s land between Portland and Gresham. This area of small farms and orchards urbanized in a piecemeal fashion in the decades immediately following the war and lacks much of the infrastructure or formal coherence of the city west of I-205. And like David Byrne, we’ve all observed it as we make our final approach, our seatbacks upright, our tray tables stowed, and all electronic devices switched off. A final thought on perpendicular loading buildings. A friend suggested we show the actual slices on one of the sad wall buildings we’ve been discussing. Here’s one on NE 15th Ave. from our last post. We’re looking at it in perspective now, so we can see how the fronts face the side lot line. 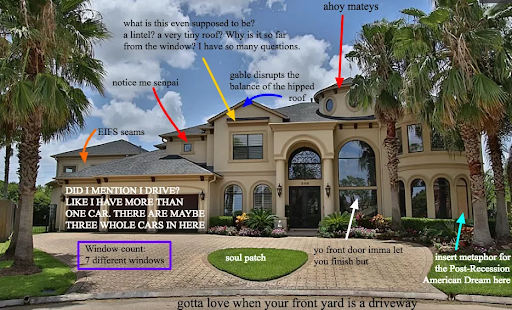 As the weather gets warmer and we spend more time walking around our neighborhoods, we’ve noted quite a few sad cautionary tales that remind us why building orientation is so important. 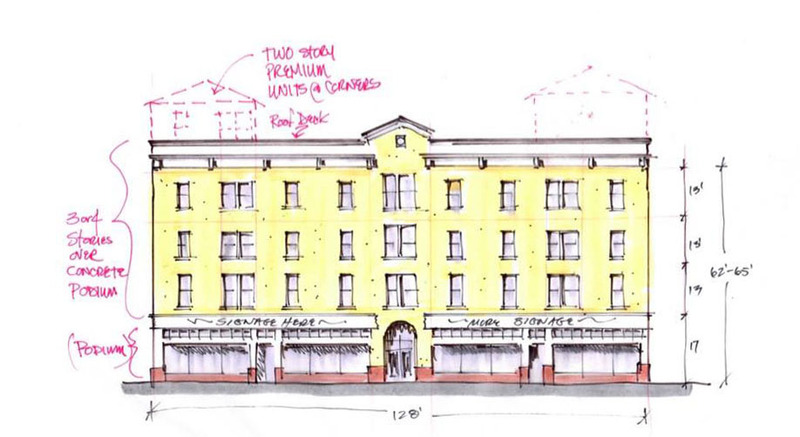 What happens when we try to orient buildings on the long edge of the lot, on a mid-block site? Spoiler alert: it usually ends badly. 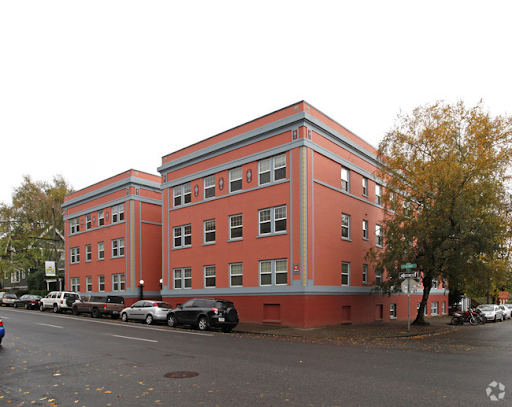 "if Portland wants to be judicious and surgical about how it inserts density into its existing urban fabric, corners seem like a no-brainer."